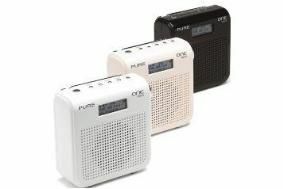 Pure launches new £40 'Mini' version of its One DAB radio | What Hi-Fi? The new One Mini has a list price of £40, diminutive dimensions and a 20-hour rechargeable battery life when powered by a Pure ChargePak. The radio is designed to be more energy-efficient than earlier DAB designs, and is part of Pure's EcoPlus range. Features include 16 presets, a headphone socket, USB socket for future upgrades, and textSCAN, which allows users to pause scrolling text on-screen (handy if the radio station is sending out info on competition entries, for example). There's also an auxillary input, which allows you to hook up your iPod or any other portable player and hear it via the One Mini's speaker.